WASHINGTON—As the Chinese regime continues to invest heavily in overseas political influence and propaganda operations, a new bill introduced in Congress explicitly seeks to curb such interference. 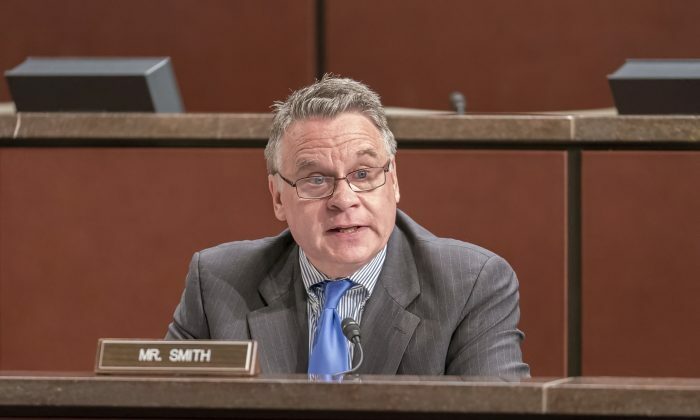 The “Countering the Chinese Government and Communist Party’s Political Influence Operations Act of 2018” was introduced on June 4 by Rep. Chris Smith (R-N.J.) and Rep. Marcy Kaptur (D-Ohio), both members of the House Foreign Affairs Committee. Smith is also the co-chairman of the Congressional-Executive Commission on China (CECC), which has been leading the charge to highlight the Chinese regime’s influence in America and its consequences. The bill would require U.S. intelligence agencies to provide a detailed report on Beijing’s influence operations in America, both covert and overt. It also calls for developing a long-term strategy to counter Beijing’s political influence, censorship, propaganda, and disinformation targeting the United States. The June 4 date was intentionally chosen to coincide with the 29th anniversary of the Chinese regime’s bloody crackdown on pro-democracy protesters in Beijing’s Tiananmen Square in 1989. The bill would require Chinese regime-funded Confucius Institutes located on American university and college campuses to register as foreign agents, a requirement that has been proposed before and supported by many, including in legislation introduced in March by Rep. Joe Wilson (R-S.C.) and Senators Marco Rubio (R-Fla.) and Tom Cotton (R-Ark.). Rubio, among the most outspoken critics of the Chinese regime’s authoritarian influence, is expected to sponsor legislation in the Senate similar to Smith and Kaptur’s bill, a congressional aide said. Another Senate bill titled “Stop Higher Education Espionage and Theft Act of 2018” was introduced on May 22 by Sen. Ted Cruz (R. TX) with similar goals in mind, although it did not specifically name Confucius Institutes nor China. Cruz’s bill would allow the FBI to designate an entity as a “foreign intelligence threat to higher education” and then require U.S. colleges and universities to follow strict reporting and disclosure rules for any financial interactions with designated foreign entities. Various members of the U.S. Congress in recent months have made statements or sent letters asking colleges and universities in their states to cut ties or end relations with Confucius Institutes on their respective campuses. Previously, top U.S. intelligence officials have publicly warned that Confucius Institutes and other propaganda platforms in the Chinese regime’s toolkit are being used to influence American society. The FBI has been investigating numerous Confucius Institutes around the country, according to Director Christopher Wray. In a Congressional hearing, Wray also said that the Chinese regime has manipulated nontraditional spies, especially those in academic settings, such as professors, scientists, and students, to steal U.S. technology and secrets. The Chinese regime’s decade’s long attempt to influence the politics of other nations has been under dramatically increased scrutiny since 2017. Countries around the world have begun awakening to the painful realization that the doors they willingly opened to China for trade and cultural exchange have let in the Chinese regime’s encroachments on their political institutions and way of life. Such interference was particularly felt in Australia and New Zealand, as media there recently delivered a series of high-profile investigative reports and headline stories about the Chinese Communist Party’s control and influence over political candidates, businesses, and academia, as well as the Chinese students across Oceania. In the United States, Democrats have given much less attention to Chinese influence activities, compared to the Russian influence operations targeting the 2016 U.S. election. However, Kaptur’s co-sponsorship of the bill countering the Chinese regime’s political influence operations is a sign that Democrats are beginning to recognize the threat posed by China.